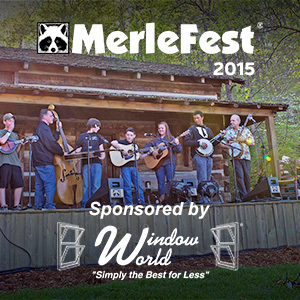 Window World Partnered with MerleFest 2015 for a Weekend of Music, Art & Community Support! Wilkesboro, N.C., May 4th, 2015 – Window World was excited to revisit its roots as the presenting sponsor of MerleFest 2015, a music and arts festival held annually in Wilkesboro, NC, the location of Window World’s Headquarters. This year’s event ran from Thursday, April 23 through Sunday, April 26, and attracted more than 78,000 visitors from around the globe. Over the course of four days, renowned artists from a wide variety of genres entertained excited festival-goers from all over the world. Just a few big names that rocked MerleFest this year included North Carolina natives The Avett Brothers, Robert Earl Keen, Trampled by Turtles and Steep Canyon Rangers, among many others. But the festival wasn’t limited to just music. MerleFest celebrates Americana culture in many ways. Between daily jam sessions, a songwriting contest, instrument picking lessons, heritage craft demonstrations and many more activities, there was plenty to do for the whole family! Born in 1988, MerleFest began as a celebration of the music of North Carolina native Doc Watson and his son Merle, who had been killed in an accident on the family farm in 1985. Until his death in 2012, Doc Watson remained the primary host for the festival. Though it continues to remain true to its roots, MerleFest has grown to include various genres of music, including Americana, Country and Rock. For Window World, MerleFest was a perfect opportunity to not only show support for yet another great cause, but also to celebrate its North Carolina heritage. As the primary fundraiser for Wilkes Community College Endowment Corporation, MerleFest helps raise money to fund scholarships, capital projects and other educational needs — a mission that Window World is thrilled to support! Artists even performed for nearly 7,000 children from local schools on Thursday, in honor of the educational initiative. As both organizations focus on giving back to the community, Window World’s partnership with MerleFest was the perfect marriage of values, celebration of American tradition and a fun opportunity to support a great cause! Founded in 1988 by Musician Doc Watson and named for his son, Merle, MerleFest is one of the largest music festivals in the United States. The event is held annually on the campus of Wilkes Community College in Wilkesboro, NC and is known to draw more than 79,000 visitors each year. The festival has become the primary fundraiser for Wilkes Community Colleges’ endowment fund, which funds educational needs. Window World of Jersey Coast is locally owned and operated in Edison, NJ. Window World is an ENERGY STAR® partner and its window products have earned the Good Housekeeping Seal for ten consecutive years. The store, located at 27 Northfield Avenue in Edison, NJ, serves homeowners in the counties of Union County, Middlesex County, Monmouth County, Ocean County, and Staten Island NY. For more information about Window World of Jersey Coast, visit jerseycoastwindows.com or call 732-417-5700.